I sorry to say I don't know much about this building in North Pearl Street, Albany, NY. Obviously it is currently a Rite Aid Pharmacy but just as obviously it was something else before that. 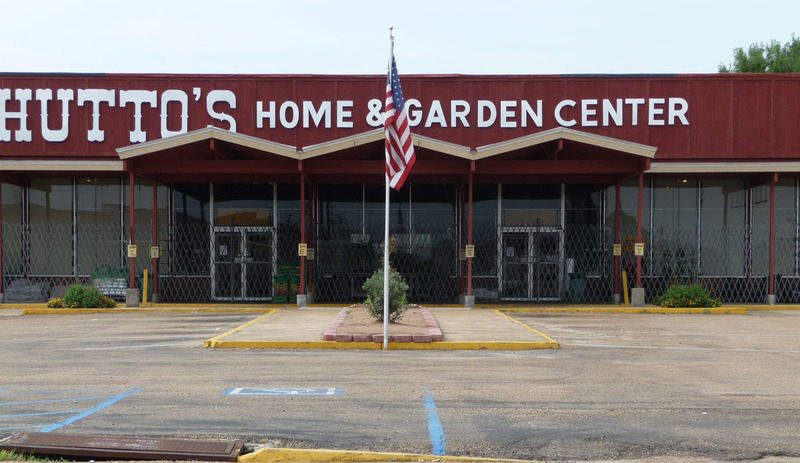 Can anyone fill me in on the history of this interesting store? 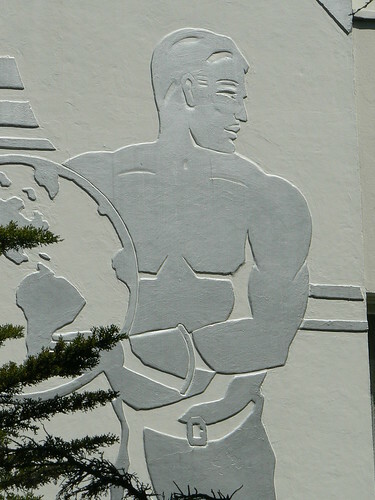 The Perth Girls' School was built in 1936 and was awarded a RIBA Bronze Medal in 1939. 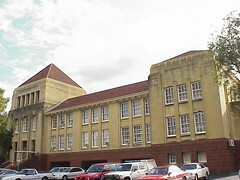 The school was designed in the Western Australian Public Works Department under principal architect A E Clare. The school closed in 1962 with the Police Department taking over the building early in 1963, staying until 1966 when a new Police Headquarters was constructed. 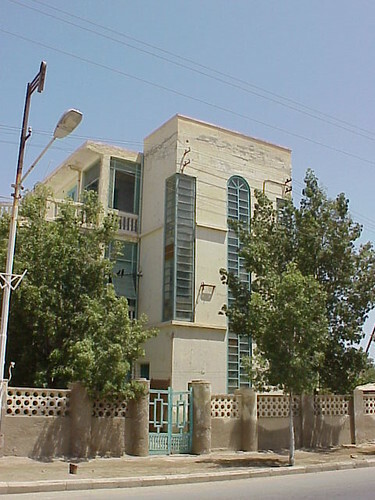 The former school is still used by the Police Traffic Department. 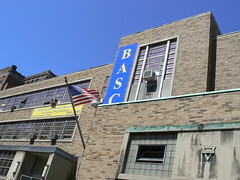 The Buffalo Academy of Science Charter School (BASCS at 190 Franklin Street was built in the early 1950s as the Buffalo premises for the Young Womens Christian Association of Western New York. For a time, prior to the construction of the modern streamline building for the YWCA of WNY, part fo the site was occupied by a house where Millard Fillmore, 13th President of the United States, had lived from 1831-1858. 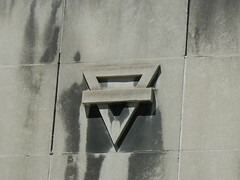 The YWCA used the building until 2006 and their emblem of a bar across an inverted triangle is still visible on the facade. 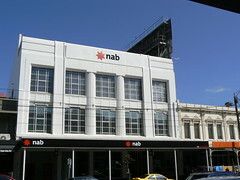 The National Australian Bank branch in Clarendon Street, South Melbourne was, in a former life, a Maples Furniture store. The company founder, Benjamin Nathan, started trading in a small shop in South Melbourne in 1887 and by 1946 there were three Maples stores in Clarendon Street and many others in suburbs across Melbourne and rural town across Victoria. 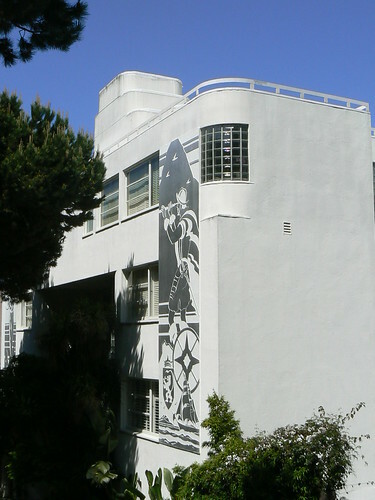 As part of its 2003 Historic Preservation Awards, the Art Deco Society of California includes this apartment building at 1580 Beach Street, Marina. Designed by R R Irvine, it was built around 1931 and in 2003, over seventy years later, it was still owned by the same family. 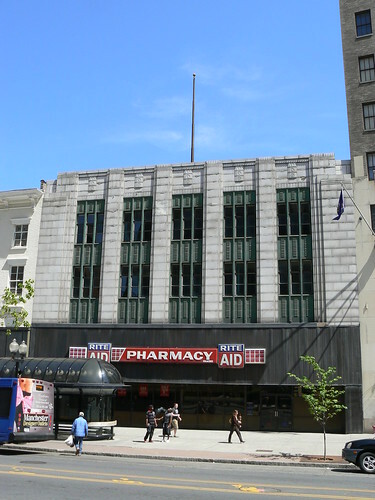 It is not difficult to see how the building was chosen for a preservation award. 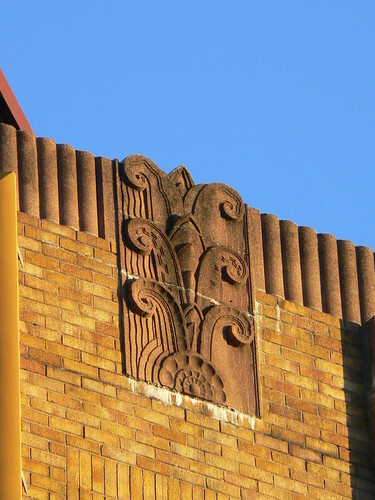 The floral panels at the roofline above the window bays are stunning. 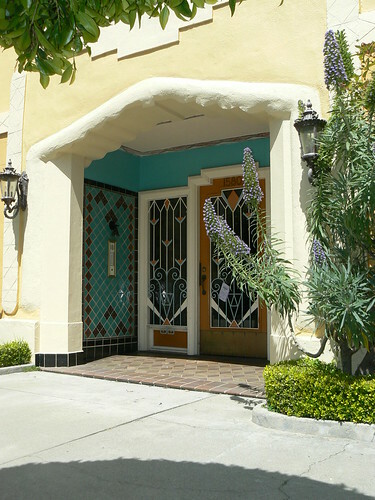 The retro-fitted fire escape interferes with the decoration of the facade above the main entrance but no doubt it is a necessary precaution in the Bay Area. I'm interested to know if the garage was pert of the original design or added at a later date. In other case it is well done in keeping with the style of the building. 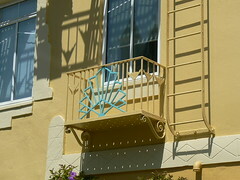 I find the paintwork on the small metal balcony a little twee. I suppose it does allow the decoration to be seen more clearly but I would have prefered to see the metalwork all the same colour and probably the beige colour rather than the blue. The entrance, on the other hand, with its combination of colour works for me and I think it would look even better when the flowers are in full bloom. 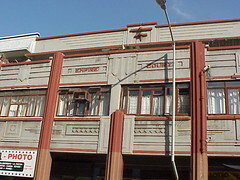 Empire Court in one of many Art Deco style buildings in the Grey Street district of Durban. 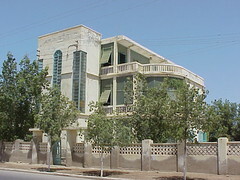 It is a substantial building with shops at street level and apartments on the two upper floors. Grey Street is the Indian part of town and that is reflected in many of the buildings from the 1930s and 40s that bear the family names of the local businesses. Another common theme for building names in this area is the British Empire as is the case here. Of course both South Africa and India were part of the British Empire. 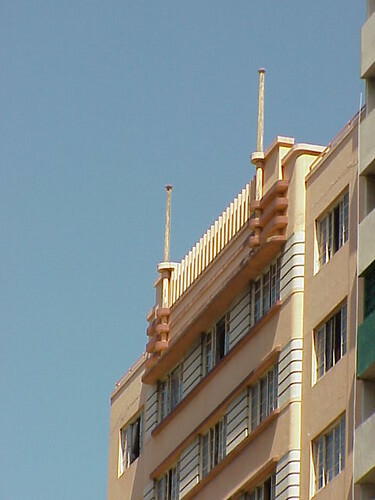 Empire Court dates from around 1937 and the facade has a rich mixture of Art Deco elements. Diamonds, horizontal stepped lines and many other patterns comprising of geometric shapes. Also of note are the decorative flagpole holders and it is a shame that the flagpoles themsleves are no longer present. 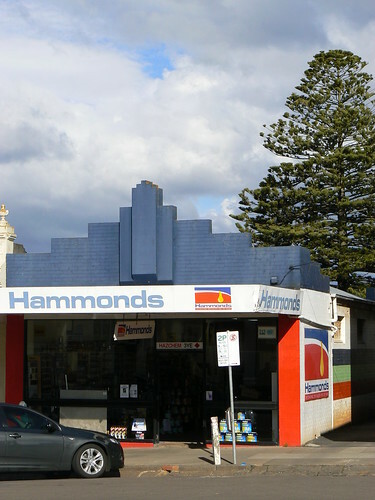 The building addresses its corner site with a curved verandah and balcony but the roofline maintains the rectangular lines of the rest of the building. This reminds me of the corner section of Wikianos Supermarket in Asmara, although in that case the roofline extends over the lower floors provding shade for the balcony area where Empire Court appears to have an open terrace above its curved balcony. 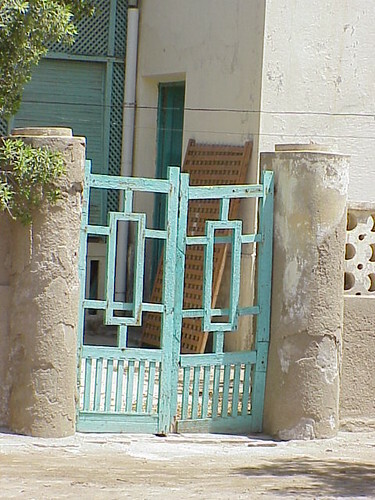 OK it is a little rundown but lots of Massawa in Eritrea is (or at least was, in 2003 when I was there). This is a great house all the same. Three storeys with open and open, curved terrace and a flat roof. The boxed section at the front of the house has two vertical rectangular panels of windows cut into the corners plus a third panel topped with a semi-circular section of windows. The central panel of windows differs from the other two in that it starts at ground level and the panes are offset rather than in the more usual grid pattern. This garden at the front of the house is entered through a lovely double wooden gate. 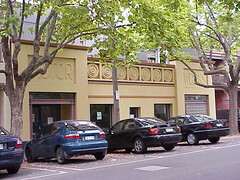 This interesting building in South Yarra dates from the early decades of the 20th Century. 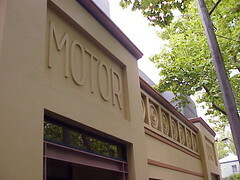 The main part of the garage dates from 1912 but the facade at the rear was probably redesigned in the 1920s giving us the bold lettering spelling out "MOTOR WORKS" above the large entrances at either end of the building and the series of seven panels with concentric circular patterns between. It is a very bold facade in a somewhat residential street and in recent years has found a useas a Creative Arts Centre for Melbourne Grammar School. 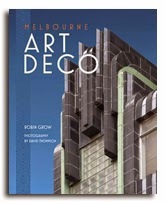 At the 2010 Victorian Community History Awards yesterday, Robin Grow's book Melbourne Art Deco won the Best Print/Publication category. I am very proud that Robin chose so many of my pictures for the book and that it has been so well received. 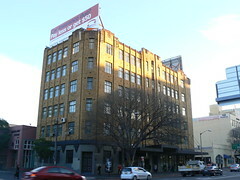 Broadway in Chippendale was widened in the early 1930s leading to a series of Art Deco style buildings being constructed. 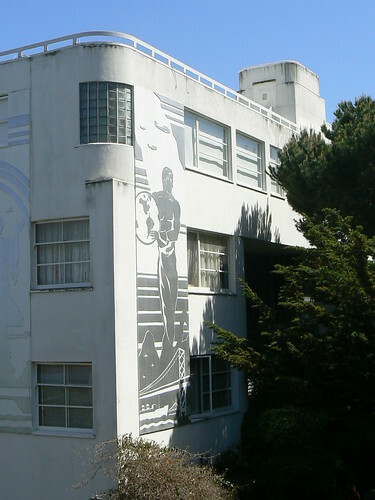 Pioneer House, designed in 1934 by Wright & Apperly, is one such building. The ground floor has been altered so there is no longer a bank or the shops opening onto the street. I don't know if the decoration has been modified from the original installation but the colour scheme is a bit dull for me. The decoration along the roofline, on the other hand, is stunning, especially when lit by the mid-winter late afternoon Sydney sunshine. 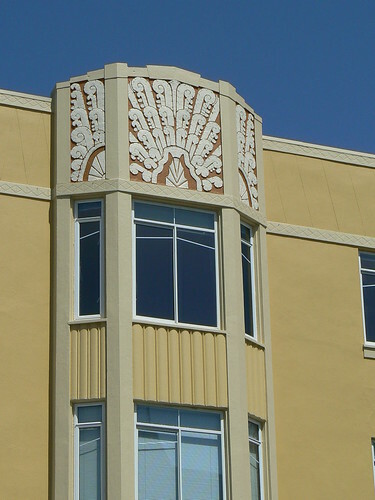 There are several different decorative panels and each spandrel has a series of ridges and bars. There is decoration above the windows including a shaft of triangular windows stretching amost the height of the building from the central entrance. 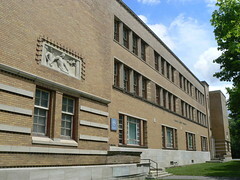 The Notman Photography and Associated Screen News Building was designed by Ross & Macdonald in 1937. William Notman was a Scottish-born photographer who established his photography business in Montreal in December 1856 and continued to take photographs until his death in November 1891. Two of his sons continued the firm with William taking over in 1891, working through until his death in 1913 and Charles, who joined his brother in 1894, maintaining the business until he sold it to Associated Screen News in 1935. 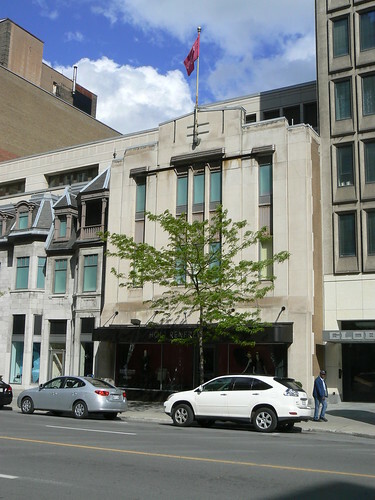 In 1995, the building became part of the nearby Holt Renfew department store also designed by Ross & Macdonald in 1937. 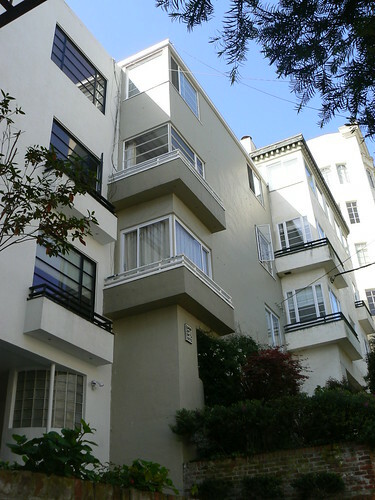 This is a block of modernist flats in Clay Street, Pacific Heights, San Francisco. I really like the way the building climbs up the hill with the lowest section set furthest back from the street. 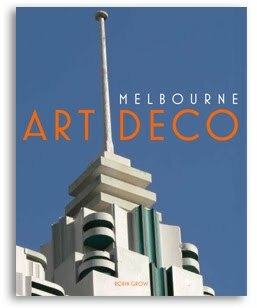 Many of the elements of Art Deco and Moderne buildings are part of this buildng. The 'blconies'with metal railings. Glass bricks providing privacy at ground level yet allowing light to reach the interior spaces. And, although not visible in the photo, the porthole windows in the garage doors. These flats date from 1938. 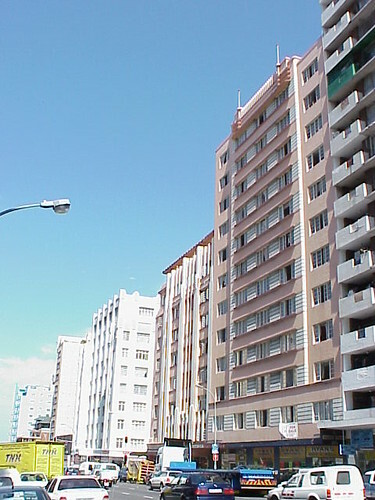 Broadway Court in Durban was designed by Obel & Frolich and constructed in 1937. 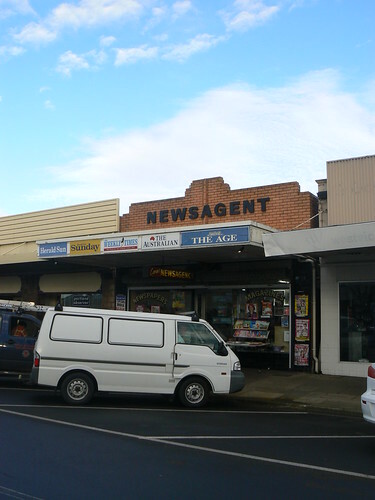 The Newsagent in Percy St, Portland is a typical example of a small deco shop in a rural Victorian town. 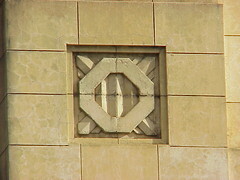 The decoration is simple, part of the brickwork, and probably the cheapest way to some visual interest into the design. 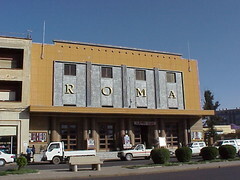 According to Asmara - Africa's Secret Modernist City, the design for the Cinema Roma was originally proposed in 1937 by Roberto Cappellano under the name Cinema Dux and although originally rejected the cinema was built soon after 1937 and for a time was known as Cinema Excelsior. The Roma name was adopted later. The authors do not go into details of alterations to the cinema in 1944 by Bruno Sciafani but the plans reproduced in the book show an enlarged front facade similar to the current building and therefore, perhaps, a larger cinema overall. The latter plan does not include the flagpoles so they may have been added realtively recently. 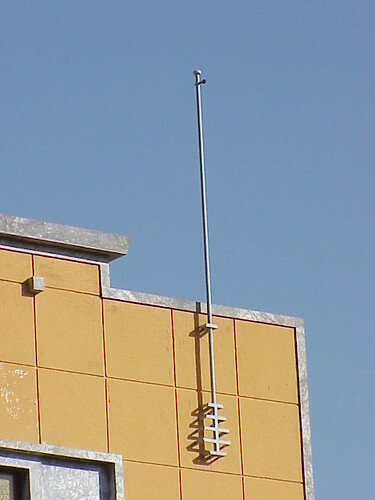 They are similar to the flagpole on these Shops and Apartments in Harnet Avenue. 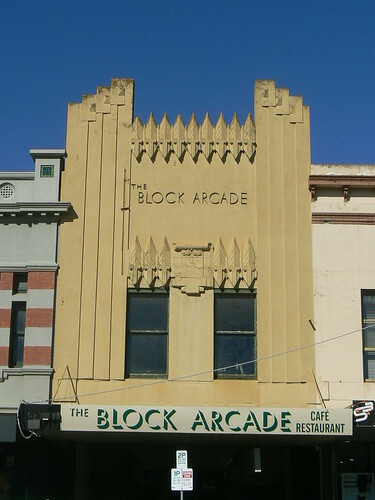 This amazing facade belongs to the Block Arcade in Ballarat. 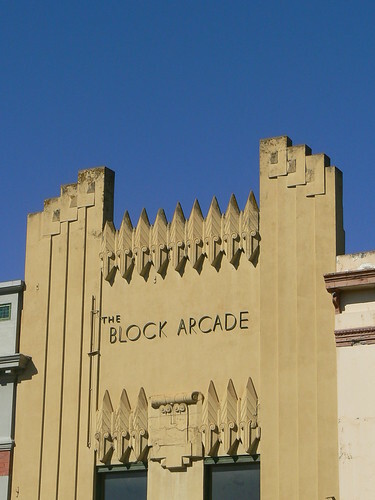 To me, those repeating elements along the roofline and also below the Block Arcade lettering could be stylised Sturt's Desert Peas, the floral emblem of South Australia. Of course I could be completely off the mark. Ballarat is in Victoria and Victoria is the only mainland state of Australia where Sturt's Desert Pea does not grow. 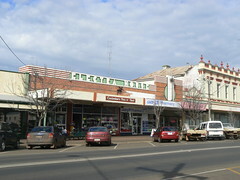 Ballarat is, however, on the main route from Melbourne to Adelaide and the Block Arcade is in the main street of Ballarat, Sturt Street. 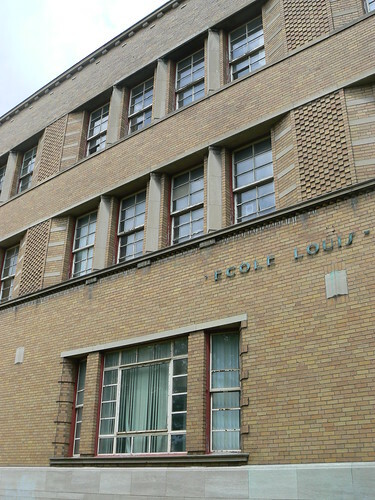 The École Louis-Hébert is in the Rosemont area of Montreal. It was designed by Charles David and built in 1936. 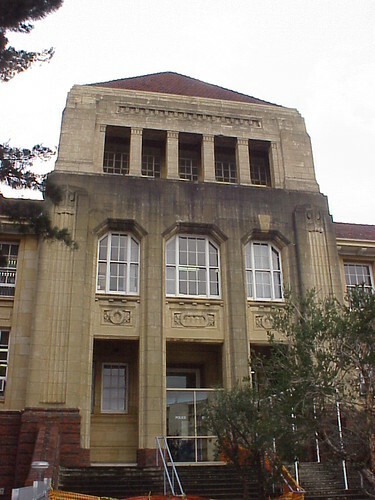 The building is three storeys high with entrances and stairwells at each end sitting out from the rest of the façade. The upper floors are identified by bands of close-set windows while the ground floor has large windows with a large square pane in the centre with smaller panes arranged around the outside and separate, narrow windows on either side angled back into the wall. 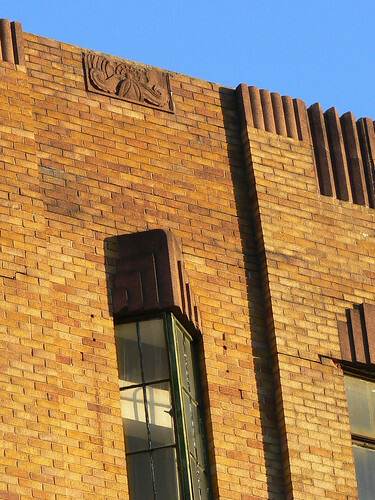 Raised bricks provide decoration at the outer edges of these windows. 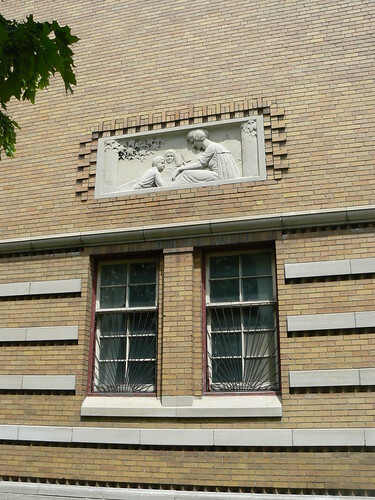 The name of the school is spelt out in metal lettering across the façade above a relief of an open book. 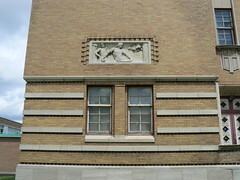 The wings at either end of the building are decorated at the lower level by bold horizontal lines and each bears a relief above the windows. 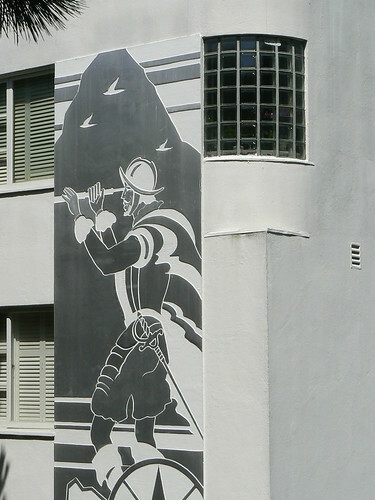 The reliefs are by Alice Nolin and each is surrounded with a pattern consisting of raised bricks. One relief shows a man and a woman, labourers on the land, while the other shows a woman siting under a tree reading to two children. 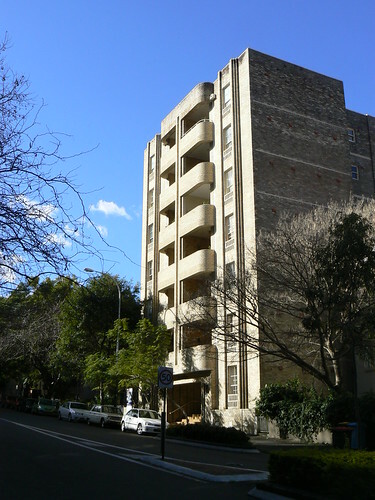 The is the Wroxton in Elizabeth Bay, Sydney. I like the combination of the horizontal bands of the balconies and the vertical columns of windows on either side. It is also really nice to see that none of the balconies have been enclosed which is too often the case. 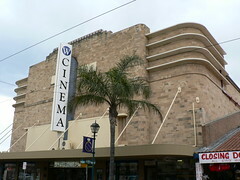 The Adelaide Chapter of the Art Deco Society are making a last ditch effort to save the former Wallis Cinema in Glenelg. As reported in the Guardian Newspaper today, they have already collected over 1100 signatures and are trying to have the building listed on the South Australian Heritage Register. Convenor of the Adelaide Chapter, David O'Loughlin, says the cinema is incorrectly recorded as being built in 1956 in a Holdfast Bay Council heritage review undermining the historical importance of the building. 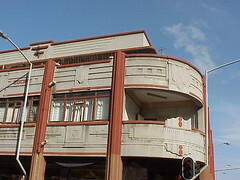 The cinema was actually designed in 1936 by F Kenneth Milne. For more information you can visit the Adelaide Chapter Facebook page or go directly to the online petition and add your name Save the Glenelg. 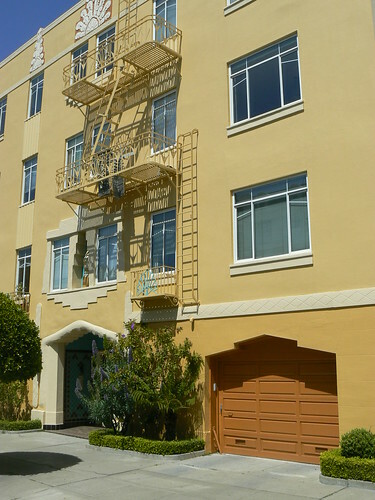 Telegraph Hill in San Francisco is home to this magnificent apartment block. 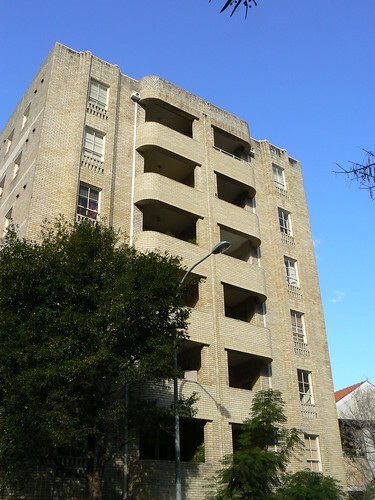 Malloch Apartments were designed by Irvine Goldstine and built in 1936-37. 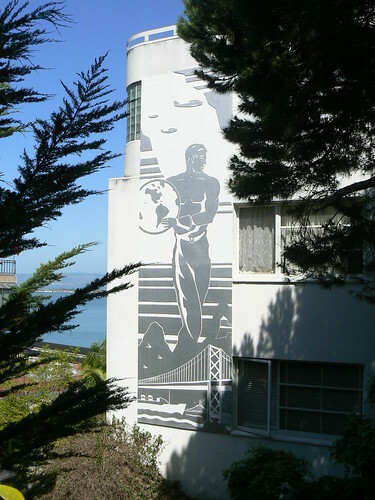 They are Streamline Moderne in style with views over the bay but the silver decorative figures by Alfred du Pont on the exterior walls set this building apart. 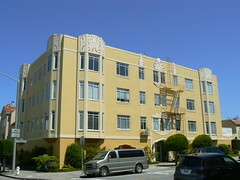 The apartments were used during the filming of the 1947 Humphrey Bogart and Lauren Bacall movie Dark Passage. 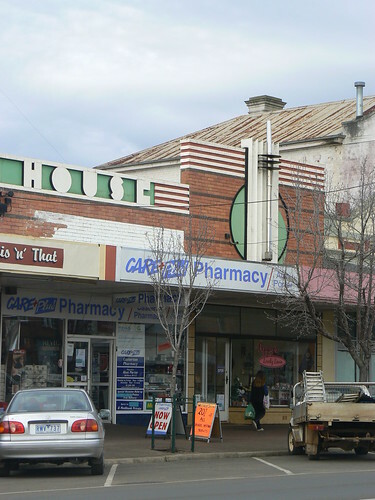 I couldn't leave Casterton, a small town in rural western Victoria, without posting this outstanding building. It is a little way up Henty Street from the Town Hall but to me the lettering and the colours put it in a different league altogether. I haven't been able to find out any details about the architect or when it was contructed however there is a reference to Electra House in The Argus newspaper from November 1938. So I don't know how this building ended up in an historic Australian country town but it did and what a wonderful sight it makes.